Your wedding dress may be one of the most expensive items of clothing in which you ever invest. Therefore, you’ll want to take your time and find the perfect gown that makes you look and feel your very best. The tradition of wearing a formal white wedding gown can be traced back to the Victorian era, when Queen Victoria wed Prince Albert. The queen wore a white gown, sparking this trend. Soon other brides followed her example and almost two centuries later, the concept continues, although much more variation now exists, with some brides expressing their personal style with their own unique picks. There are a wide variety of wedding dress styles to choose from today, including vintage, traditional, streamlined, fashion-forward or more unusual styles. There’s also an array of fabrics, techniques, colors and detailing from which to choose. 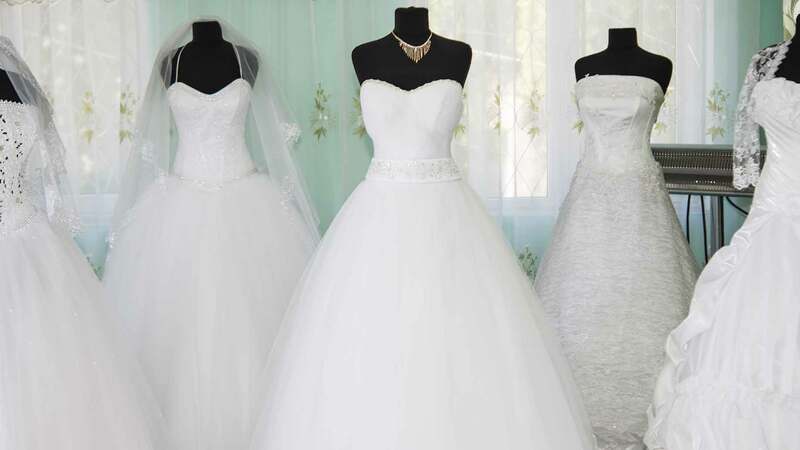 For instance, do you want a crisp white wedding dress, or one with a hint of cream, tan or blush? Should it be layered in folds of silk, satin, chiffon or lace? Is wedding dress beaded, embroidered or embossed with roses? All of these details will affect the overall look, as well as the price range. The best place to start looking for your wedding dress is in the pages of your bridal magazines. These can be an important source of information, ideas and inspiration. Some of the popular reads include Brides Magazine, Modern Bride Magazine, InStyle Weddings, and Martha Stewart Weddings. Most of these magazines also have websites packed with information that can help you learn about the latest dress choices available and help you narrow in on what you like. Some lucky women will look good in most, or all, of these cuts, while others may find only one shape that looks good and suits their taste. While there are no hard and fast rules today when it comes to what you select, fabrics like heavy satin, shantung and peau de soie are a few of the popular choices for a formal evening event. Often evening wedding gowns will be adorned with high-quality lace and other extras. A very long train and long veil will also be appropriate for the occasion. For a formal daytime wedding dress, satin or shantung that’s a little lighter weight can be a good choice. The train can be shorter for daytime, and the veil may be fingertip length. For a semi-formal wedding, you might select a wedding dress in silk or chiffon with a short train and shoulder-length veil. For a very informal event, you can even go for a short wedding dress or even a classic suit. You can skip the veil and may opt for flowers in your hair or a hat instead. Many brides want to start shopping for a wedding dress as soon as they get engaged. While you might think this is jumping the gun a little, it’s actually not a bad idea to begin your search at least a year before the wedding date. This will allow plenty of time to find the perfect wedding gown and to also have it altered to perfectly fit your body shape. You can start your wedding dress shopping at local bridal chain locations liked David’s Bridal for a wide selection of options with some affordable choices in the mix, or you can check out the more exclusive bridal salons in your area, where you may find some unique gowns. Kleinfeld Manhattan (the store featured on The Lifetime Channel/Discovery Networks reality series, “Say Yes to the Dress) is one of the most well-known and exclusive wedding gown stores right now. You can also look at some department stores that offer specialty bridal departments, includingJCPenney (where you can find very basic and affordable dresses, including plus sizes), Neiman Marcus (which has an exclusive bridal salon), Saks Fifth Avenue (which offers special bridal trunk shoes) and Bergdorf Goodman, (which carries top-of-the-line designer gowns). Some women’s popular chain stores are also getting into the bridal attire business now, like Ann Taylor, White House/Black Market, and J Crew. Other places to check include designer boutiques, bridal resale stores, online shopping venues and vintage shops. If there’s a bridal gown specific manufacturer that you like, you can also call them to find out who carries their line. If you can’t find anything you care for, you can consider having something custom made. Or, you might have your mother, grandmother or other family member’s gown altered to fit your shape. If you’ve found a photograph of a wedding dress you love but you’re having trouble locating it locally, you can ask the manufacturer to give you the names of stores that may sell it. If you need to order it online without trying it on, it’s worth considering having a seamstress professionally measure you to be sure you order the correct size. If you plan to shop in person, many bridal stores ask that you make an appointment with one of their bridal gown consultants to ensure there will be a person who can devote the time and effort into helping you when you arrive. Brides often bring their mother, aunt, grandmother, sisters and a few close friends with them on their first shopping trip. It can be helpful to get input from a few people you trust, but if you have too large a group in tow with strong opinions, this can be distracting and can make it difficult for you to stick to your personal goals and preferences. Once you’ve found your wedding gown, if it’s something on the rack, you may be able to take it home on the spot. If the store offers alterations, though, you’ll probably want to take advantage of this convenience first. If it’s made-to-order, it can take a few months or more for the final product to be ready. You’ll still need to have several fittings to get the measurements perfect for your proportions and shape. A custom-made wedding gown created from scratch based on your own design specifications can take even longer and involve more fittings. Most bridal shops will give you a formal contract for your wedding dress. This should include the price, size of the dress, manufacturer, measurements, payment terms and date of delivery, as well as whether alterations are included. You’ll need to find out what the payment schedule is. If the wedding dress is being ordered, you can often give a deposit up front, then pay the balance when the item comes in. The experts stress the importance of knowing how much you want to spend before you hit the bridal stores. This is because it can be dangerous to try things on that are way above your price range. If you fall in love with a gown you simply can’t afford, it can make it difficult then to settle for something that costs less, forcing you to choose between going over budget or settling for your second choice. You might also think that the more money you have to spend, the more elaborate your gown will be. This can certainly be true, but it doesn’t have to be. Of course wedding gowns with beading, embroidery and other handwork can be made from pricey materials and require extensive time. But some of the less expensive gowns are also very ornate, too, made from inexpensive materials, so you don’t have to spend a lot to have a fancy flair. Keep in mind that some of the more expensive designer wedding gowns are made from high-end material and actually have very simple, elegant, lines and little or no ornamentation. What distinguishes some of these premium options is how well cut they are and how well the fabric falls, enhancing the wearer’s shape. If you can’t see investing much in an item you’ll only wear once, you can find but a very basic wedding dress right off the rack at a discount bridal shop for as little as$100. This will probably be a synthetic fabric with little ornamentation. For a little more of an investment, you can get a wedding gown made from a light-weight silk or satin with simple lines that was made by machine. This can cost up to about $1,000. If you want a moderate designer gown, higher-end fabrics and elaborate detailing, this can set you back between $1,000 and $3,000. For a more prestigious designer wedding gown, or a custom-designed option, or lots of handwork, the price can range from$3,000 to $10,000+. Many brides spend in the $1,000 to $3,000 range for their wedding gown, but the options start at $100 and go on up to $10,000+. Note that alterations are usually an additional several hundred dollars on top of the gown’s purchase price. Whether you shop for your wedding gown in a store or online, the experts advise paying for it using a credit card. While most bridal salons are very reliable, if you do end up having a miscommunication on this most important purchase and what get isn’t what you expected and you can’t get any help from the store, you’ll at least have proof of your payment and be able to seek help from the credit card company in resolving the issue.